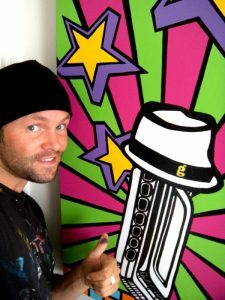 Painting in concert with "G" Love and Special Sauce in San Diego, Ca. The concert in Del Mar, California with “G” Love and Special Sauce went awesome!!! I was able to finish the painting in under 90 minutes and it turned out pretty dope. All of the pics are posted on the website in the “Snapshots” section so check them out! “G” loved the piece and it will join the others that hang in his studio and in his house in Boston/Philly! Here’s a pic of the final piece! !